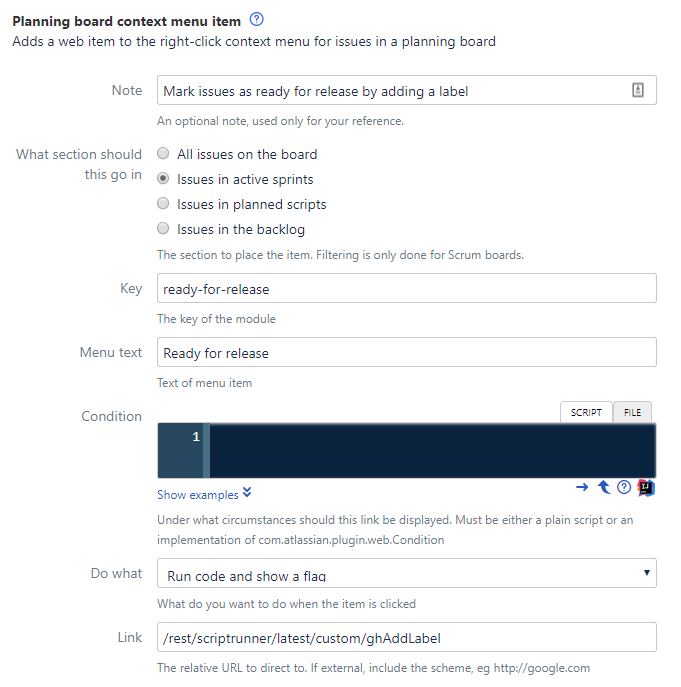 This is a variation of a web item, that allows you to place a menu item in the context menu (right-click) of issues in a Scrum or Kanban board. As with other web items you have the option of calling a REST endpoint which can cause a flag or dialog to be displayed (or have no visible output), or linking to another page. Examples of usage might be to set a specific label on the selected issue(s), or run them through a workflow transition with hard-coded field updates. 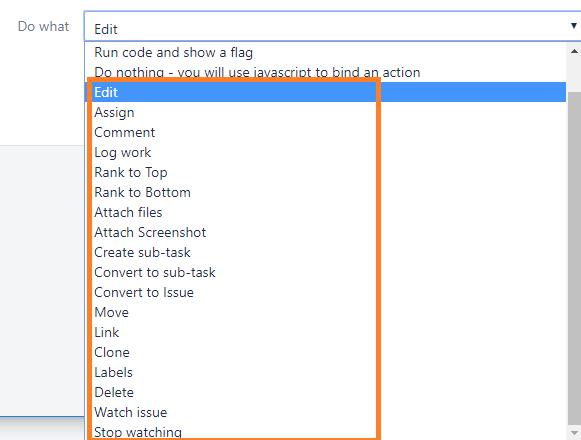 You can also add commonly-used actions that are available through the "dot" menu to the context menu, for example Create sub-task, Clone issue, and so on. 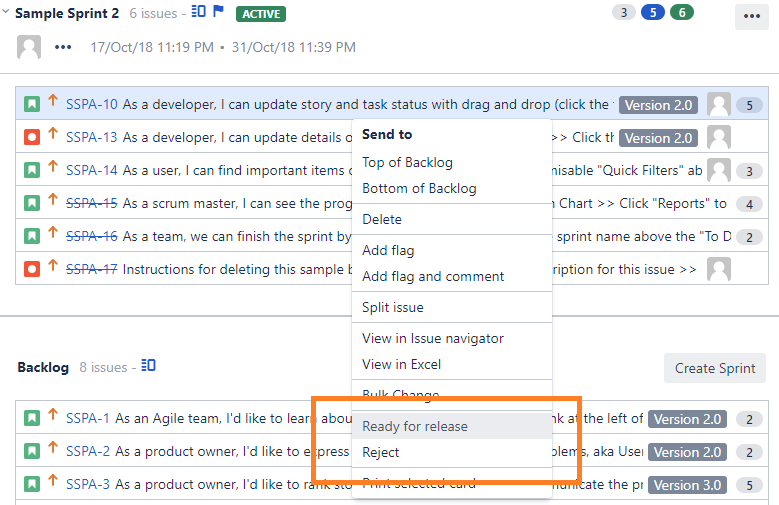 You can restrict whether the context menu item appears on issues in active sprints, future planned sprints, the backlog, or all three. Currently the position of the context menu items is fixed - they will always appear in a new section above Print selected card. Contact us if you want more control over the positioning. We will add a menu item that will add a pre-defined label to any selected issues. In your business process, this may signify that some kind of review has happened. You could also configure the board to drive the card colours from JQL queries selecting this label, which would make it more apparent which cards had been labelled. The link points to a REST endpoint that we have created previously. The code for this is shown below. The issue keys of the selected issue keys will be passed to the endpoint in the issueKeys parameter. This will always be an array, even if a single item is selected. 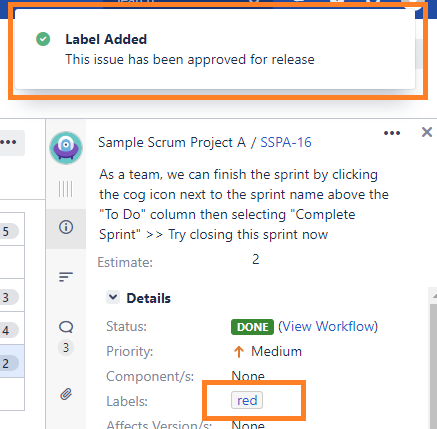 body : "This issue has been approved for release"
On clicking on the new context menu item (if you don’t see it double-check the issue is in an active sprint), the issue will be labelled, and a flag will appear. Unlike other web item conditions, these receive a List of com.atlassian.jira.issue.Issue objects in the script binding. This is because you can multi-select issues and then right-click. There are further examples shown on the configuration page. As always, you can see all available binding variables by clicking the question mark icon under the script box. For actions that invoke one of Jira’s built-in dialogs, such as Create sub-task, there is no need to provide a link - indeed the link will be hidden in the configuration page. You can provide a condition, but we will automatically apply relevant conditions - for instance if the issue is already a sub-task, the Create sub-task item will not appear. Likewise if you are already watching an issue, the Watch Issue item can’t be made to appear. Additionally, all of these actions will only be shown if only a single issue is selected.